Have you ever noticed that little phrase at the bottom of the mirror on the door of your car? 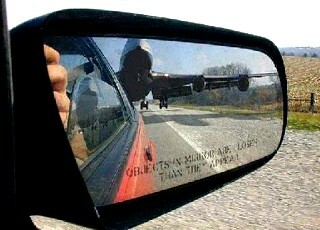 It says, "objects may be closer than they appear". It says that because when you look at whatever is behind you in the mirror, the image is somewhat distorted and looks like it is not that close. Looking closer you see that it may be right there behind you!